I went to Whole Foods over the weekend and was excited to see one of my favorite summer snacking foods had arrived and looked plump and fresh…Black Grapes! I love these things! I got addicted to these when I first discovered them while I was living in Austin. It makes them that much more special when you only get them seasonally. It helps you to really appreciate the flavors this way. Just a side note here, because I know people are saying what is she talking about, you can get grapes all the time. Well, no, no you can’t if you eat organic! Grapes are heavily sprayed fruits. I would only recommend you eat them organic or else just pass them up. Get your fill of them when they are in season, just go to town. Plus you can always freeze a bunch for snacks or to add to smoothies during the off season. So, last night I was at the sink picking them off the stems and doing my prep work so that I have good healthy snacks at the office this week, like you should. Well, half way in I realized my hands were dark purple. I thought to myself, heck ya!!! You see all this fruit dye is just straight up goodness for your body. If it dyes your hands, you know it’s doing amazing things for your body. 1. High Vitamin & Mineral Content. They contain high levels of A, C, B6, folate, calcium, potassium, manganese, zinc, copper, and iron. Every – body can use a little of this, straight up nutrition. 2. Polyphenols. Polyphenols contain antioxidant and anti-inflammatory properties that help reduce DNA damage from free radicals. Polyphenols have been researched for their effect in slowing the aging process as well as cardiovascular disease, dementia and cancer. In 2005 the American Society for Clinical Nutrition cited that polyphenols help prevent cardiovascular disease, cancers and osteoporosis. 3. TransResveratrol. The dark skins of the black grape are really high in this compound. Studies are finding that this compound may have health benefits including lowering LDL cholesterol and reducing cardiovascular disease. 4. Detox. The antioxidants, including anthocyanins, in black grapes help to flush out toxins from the body. This is important for weight loss. Stored toxins may slow down weight loss, but on the other hand when you do lose weight you release a lot of stored toxins, so black grapes will help on both sides of your weight loss journey. Remember the darker the fruit the more antioxidants it contains, thus my happy dance for purple hands. 5. Blood Sugar. Black grapes have a low glycemic index, between 43 & 53. Several studies have shown they help to control diabetes. They help to increase insulin sensitivity which helps maintain healthy blood sugar levels. 6. Cardiovascular Health. 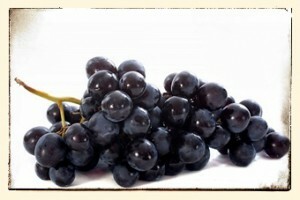 University of Michigan Cardiovascular Center suggests black grapes may help to treat and prevent cardiovascular disease. The phytochemicals (mentioned above) actually help protect genes to reduce damage to the heart muscle. Of course they have a simple blood pressure lowering effect as well and the lowering of LDL cholesterol that I mentioned above. 7. Brain Function. The polyphenol content helps to aid in treating migraines, dementia and may help in preventing Alzheimer’s. Regular consumption improves brain function, memory, and concentration. 8. Longevity & Resveratrol. Resveratrol is a phytochemical that helps to slow the oxidation of cells from free radicals which will provide you added protection from aging and degenerative conditions like cancer. Black grapes have a higher concentration of this nutrient. 9. Quercitin. This nutrient is a great anti-inflammatory chemical as well as an antioxidant. You can often times find it in natural allergy remedies. Research also shows that it may reduce the risk of blood clots. 10. Improve Vision. Black grapes contain Lutein and Zeaxanthin chemicals that help to maintain vision and eye health. You will find these in many protective eye sight supplement formulas. 11. Constipation. They typically help to relieve constipation through their mild laxative effect. Plus a big bonus is they taste great! What more could you ask for in a summer treat. You can always freeze some as well for an ice cold refreshing treat on a hot summer day. Kids really like them frozen. Try them and let me know what you think. This entry was written by Dr. Shelly Masters , posted on Tuesday June 10 2014at 03:06 pm , filed under Health News and tagged antioxidants, black grapes, blood sugar, cardiovascular disease, constipation, demential, detox, diabetes, food prep, grapes, healthy snacks, insulin sensitivity, laxative, longevity, lutein, organic, polyphenols, quercitin, seasonal food, snacks, transresveratrol, vision, vitamins & mineral, weight loss, zeaxanthin . Bookmark the permalink . Post a comment below or leave a trackback: Trackback URL.